Includes full-chapter bibliographies and a useful appendix that describes superfinishing techniques! 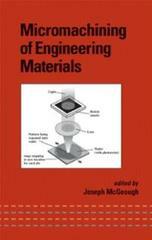 This book considers materials shaping processes used to produce engineering components of small geometry and high accuracy, focusing on conventional methods such as microgrinding and diamond turning and new techniques ranging from ultrasonics to high-resolution lithography. Presenting applications for the microelectronics, computer, medical, and aerospace industries, Micromachining of Engineering Materials is a must-have reference for materials, manufacturing, mechanical, industrial, production, and design engineers; machining technologists; ceramists; tribologists; and upper-level undergraduate, graduate, and continuing-education students in these disciplines.